This page is a revised version of the original submission of an article entitled "Comparing Couplers" published in the August 1996 issue of Garden Railways Magazine. Editorial changes and additional artwork that might have been made by Garden Railways are not included in this document. The only "standard" coupler for large scale trains is the LGB type hook and loop coupler. Most large scale cars and locomotives either come equipped with the hook and loop couplers or has a set included for optional installation. All types of hook and loop couplers seem to work with all other types. There is no such standard for large scale knuckle couplers. There are many available types of more or less prototypical knuckle couplers on the market, but unfortunately no one type will fully interoperate with any other type. In the HO scale world the Kadee coupler has become a standard because it looks somewhat like a real coupler, it works quite well and the only other standard coupler, the NMRA hook and horn design, is such a bust. If you want to use a knuckle coupler on your large scale trains, you have to select a particular type and stick with it. I've tried many of the available types and I would like to share my experience so that other modelers don't have learn all of it on their own. The types of couplers that I have evaluated are listed in Table I along with my personal evaluation of their performance. Figure 1 shows the relative size and appearance of the couplers. A good coupler should be prototypical in appearance and scale, inexpensive and easy to mount. It should either couple or not couple reliably depending on the situation. Ease of manual uncoupling is important for indoor layouts where the couplers can often be reached without bending down. Although some model railroaders feel that using a 1:1 scale hand for uncoupling is in bad taste, it is very expedient. Convenient automatic coupling is important for locations that cannot be reached by hand and for most operational situations on an outdoor layout. History Of The American Type Knuckle Coupler In 1:1 Scale. Up until the late 1800's, most railroads used a coupler called the link and pin coupler. It was simply a large metal link that looped around a removable pin on each car. It was simple and easy to manufacture. It was also very dangerous. Coupling between each car was sloppy and links routinely broke when jerked too hard. Broken couplers accounted for a lot of train wrecks. A brakeman had to step between cars to insert or remove the pins. Hundreds of trainmen were crushed to death every year, and thousands more lost fingers or whole hands in accidents while working between cars. In 1872 Eli Janney invented the Janney Automatic Coupler which was tested by the Master Car Builders Association from 1885 to 1887. The Master Car Builders (a group which represented most of the major railroads) selected the Janney coupler over 41 other types to be the standard coupler for all American railroads. The Safety Appliance act of 1893 made the Master Car Builders recommendation mandatory for all common carriers. Operationally, the knuckle coupler was a tremendous improvement over the link and pin. The trainman may still have had to manually open and align the knuckle, but this could be done with the train at full stop and with a large gap between opposing cars. The coupler could be disengaged by firmly yanking on a handle installed on either side of the car without the trainman having to stand between cars. Passenger and commuter trains use spring loaded buffers between cars in addition to the knuckle coupler so that the remaining slop between cars can be eliminated. This slop, when used by a skilled engineer in freight service, can make it easier to start a heavy train. However the resulting jerk is unacceptable to passengers. With the exception of the Aristo and Kadee couplers, the available large scale knuckle couplers operate nearly like the prototype. The knuckle is secured when a gravity operated pin latches the knuckle closed. The pins can be pulled up from the top to unlatch the coupler, although the more practical method is to push the pin up from the bottom. The Aristo coupler is similar except that the locking pin is spring loaded and not accessible from the top of the coupler. The Kadee design is unique in that the whole knuckle assembly slides aside to allow engagement with the opposing coupler and is prevented from uncoupling by cleverly placed bumps and ridges. Uncoupling is achieved by magnetically acting on a magnetic rod hanging below the coupler to rotate the coupler faces apart once slack has been established in the couplers. The rod is fashioned to look something like a brake hose. For more information on the Kadee coupler, see Kadee Tips. In about 1990, I started in large scale trains with a couple of Bachmann sets. One set had knuckle couplers but my kids got frustrated with them because they were hard to couple and uncoupled by themselves. I removed these ineffective couplers and replaced them with the hook and loop couplers also supplied with the set. These worked much better for toy train purposes but as my interest in large scale grew, I became equally frustrated with them as well. 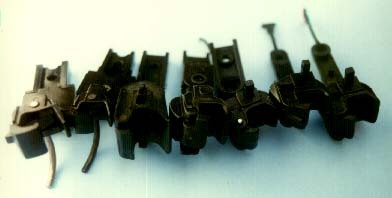 The Bachmann sets came with symmetrical couplers, that is there were hooks and loops at each end of the cars. These coupled reliably, but were difficult to manually uncouple. LGB's standard configuration is asymmetrical, there is a hook and loop at one end of a car, but only a loop at the other. These were easier to manually uncouple but tended to uncouple at undesired times, especially at abrupt changes in grade. Also, if a car got turned around, it couldn't be coupled on a train. Remote uncoupling of asymmetrical couplers can be done with an inexpensive spring loaded uncoupling ramp that can be placed anywhere on the track. The symmetrical configuration requires two spring loaded ramps or one LGB 1056 automatic ramp and one spring loaded ramp. The spring loaded ramps are fairly reliable, but they can cause a train to uncouple when it isn't desired. What really bothered me about the hook and loop is that once uncoupled, cars could not be pushed and spotted at other locations as the couplers would just relatch. I was forever moving the manual uncoupling ramps around to where I wanted to leave cars. I tried a pair of LGB 2019/2 knuckle couplers. I initially found that they were somewhat difficult to couple, but once coupled, stayed that way. They could be manually uncoupled easily and would not recouple when steadily pushed so I could spot cars where ever I wanted. I determined that the problem with stiff coupling was caused when the locking pin did not drop quickly enough. A sticky pin is caused by inadequate lubrication and sometimes aggravated by a small mold mark left on the side of the coupling pin. LGB products are superbly engineered and manufactured and the existence of a mold mark is uncharacteristic, however each and every coupler has exactly the same mark. Ten seconds of file work will take care of the mold mark. The locking pin must be ABSOLUTELY free to drop during coupling. When new, few, if any, of the couplers work properly. To obtain good performance, first burnish the pin by sliding it up and down in the coupler body while pressing it against the body. Do this on in all the pin's bearing surfaces. Also, hold the knuckle tightly closed and burnish the pin against the knuckle. Then lubricate all surfaces of the pin with graphite (not oil). Squirt more graphite into the interior of the coupler and work the pin against all of its bearing surfaces to work the graphite into the surfaces. Also, smear graphite on the body of the coupler in any spot that it touches another coupler. Observe the coupling performance. If the pin doesn't drop freely all the way, work the coupler over some more. Coupling is both rate and pressure sensitive. With a light tap, the couplers will engage although when coupling one very light car, the car may bounce away before the couplers can engage. Adding a load or metal wheels usually results in enough mass to prevent this problem. With a steady push, the couplers won't engage, even when pushing a heavy cut of cars. The LGB coupler fits nearly every mass produced large scale car with zero or minimal modifications to the car. Perfect....except that the couplers are not very visually attractive and are the most expensive available. They also require a fairly expensive automatic uncoupling ramp and associated controls for uncoupling locations that can't be reached by hand. The LGB 1056 uncoupling ramp is built into a 150 mm track section, so moving or installing it can involve significant trackwork hassles. Some attention is required to properly mount the LGB knuckle. If the coupler is not at the right height, the uncoupling pin may miss the automatic uncoupling ramps. The pin of a closed coupler should be about 0.1" above the railheads. Also, if the coupler is not mounted level, it will not couple properly as the pin is gravity operated. On most cars, the coupler position will not require any adjustment. On cars that require work, heating the coupler mounting arm with a hair dryer will allow it to be tweaked to the right position. A few years ago, Kadee began offering a large scale version of their popular HO coupler. I tried these as well. They couple with almost zero force and rarely uncouple on their own. However, like their HO cousins, they are difficult to manually uncouple. Kadee offers permanent magnets that can be placed between the rails at strategic locations to allow uncoupling. When a train is stopped with a pair of couplers over an uncoupling magnet and slack is applied by slightly backing the train, the uncoupling ramp will act on the curved rods hanging below the couplers, forcing them aside to allow the couplers to disengage. If the couplers are then separated, they will snap fully aside so that if reengaged, the couplers will not latch. Kadee calls this "delayed coupling." The car or cars can then be pushed and spotted at another location. However, if the cars roll ahead because they are on a downgrade, or the locomotive jerks, the couplers will separate and immediately snap back to the engagement position so that as soon as the loco catches up, the couplers will reengage. This is the only real drawback of the Kadee design. The Kadee coupler is very popular and Kadee manufactures a variety of both truck and body mounted styles that will fit most rolling stock although minor modifications to the rolling stock may still be required. The most common version fits over the existing coupler mounting tang although a new hole must be drilled for the screw used to mount the coupler. When mounted this way, I find that the couplers stick out too far. I find it more acceptable to cut off the end of the mounting tang and use the existing hole for the mounting screw. This sets the coupler closer to the car and reduces the resulting large gap between cars. For large scale trains, Kadee makes both "G" and #1 scale couplers. They are identical except for their size. I find that the #1 scale couplers look better because they are smaller, but the "G" scale couplers work better especially when cutting a single car. The larger size of the "G" scale coupler allows it to couple more easily in curves and they uncouple more reliably. The #1 scale couplers sometimes get jammed during uncoupling and won't uncouple without manual intervention. Unlike their HO and N cousins, the parts of these couplers are big enough to see without the aid of an electron microscope and I have had little difficulty assembling them without launching the springs into the wild blue yonder. Pay close attention to the Kadee instructions for burnishing and lubricating the couplers during assembly, it really does matter. Kadee's magnetic uncoupler is inexpensive and can be placed right on top of an existing track section, even on a curve although Kadee doesn't recommend it. The magnet should be fastened down as it will tend to lift when the couplers go over it. If the rods drag on the magnet, uncoupling reliability is impacted. I just use a little contact cement to tack the magnet down so it is still easy to move if desired. Note that the magnet is quite strong and will trigger most magnetically operated sound systems. If you have a wide mix of rolling stock and want to switch to knuckle couplers, the Kadee coupler is probably the most cost effective and will provide excellent service aside from the one hassle while spotting cars. Aristo Craft equips all of their locomotives and cars with a coupler designed to look like a standard USRA coupler, although it is over scale. Performance wise, the Aristo coupler is similar to the LGB coupler and it can be manually uncoupled easily or automatically uncoupled with an LGB remote uncoupling ramp. It will not automatically mate with any other type, although manual mating is possible. The Aristo coupler is pressure sensitive so that while spotting cars, the couplers tend to relatch much more easily than the LGB coupler. If you already have, or are considering purchasing mostly Aristo equipment, then their coupler is one that should be considered simply because of cost, which is zero. 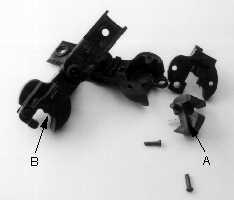 To mount the Aristo coupler on a non Aristo car, the end of the coupler mounting tang must be cut off, similar to the modification required to mount a Kadee coupler. There is some variability in Aristo's manufacturing process which results in coupling difficulties in about 25% of the units that I have, and I've got quite a few. This problem can be fixed. On some of the units, the knuckle must be pushed in too far before it will latch. If you carefully examine one that works right and one that doesn't, you will see a difference in the latched position of the knuckle. To remedy this situation, disassemble the coupler and grind off about 0.020" from the latching edge on the knuckle, point "A" in Figure 2. Another difficulty exists in the shape of the "palm" of the coupler. Some couplers have a small lump where the surface should be fully concave. Use a Dremel tool or round file to grind this area, "B" in Figure 2, back to a smooth concave curve so that the opposing knuckle can full enter to depress and latch the coupler. A good pair of couplers will latch when pressed lightly and there will be a fair amount of slack in a coupled pair. A bad set may not latch at all, or once latched, may be locked tightly together. Figure 2. Points that may need adjustment on the Aristo knuckle coupler. The Bachmann coupler is not nearly as reliable as any of the three already discussed. Early production Bachmann couplers didn't work at all and there didn't seem to be any way to fix them other than to glue them shut. Ones manufactured in the last couple of years couple easily, so easily that spotting cars is nearly impossible, and they also uncouple at unexpected times. The couplers mount very low with respect to the other types and won't even manually couple reliably with other brands. The centering spring arrangement is unique to Bachmann which makes them more difficult to adapt to non Bachmann rolling stock. I don't recommend using them unless everything that you have is Bachmann equipment. The little experience that I have with Lionel and USA Trains couplers led me away from them. Their primary problem is that the couplers do not have the ability to rotate or swing in relation to the mounting point on a car without some serious modifications to the car. This causes significant difficulties tracking in the "S" curves that occur so readily with large scale sectional track, especially when coupled to a body mounted coupler such as found on many small switch engines. They do not mate well with other types and may be difficult to mount on other types of rolling stock. I feel that a general conversion to these types would be more trouble than it is worth. However there is a contingent here in Southern California that prefers the USA Trains couplers over any other kinds in mostly body mounted applications. Of all the kinds available, the USA Trains coupler looks most like a real knuckle coupler. All of the knuckle couplers have a more restricted lateral coupling range that the hook and loop types. The couplers must be nearly centered for them to engage. This is an irritation when coupling on straight track can and can make coupling on curves impossible. This problem can be pretty much eliminated by shimming the wheelsets so that the truck frames have much less slop with respect the wheels. This aids greatly in keeping the couplers centered and allows reliable coupling in most cases. 1/32" thick #6 nylon washers work well for shimming wheelsets. Virtually all G gauge trucks can take one washer at each journal, some require more. Buy your washers in bulk as you'll use an average of 12 per car. You can get suitable washers, p/n 90295A080, from McMaster-Carr Supply Co. for $2.10 for a bag of 100. Install washers until the next washer would cause the wheels to bind. You can have two washers on one side and one on the other, but make sure that the double washers all go on the same side of a truck. Wheelsets can be popped out of most trucks without disassembling them by simply deflecting the sideframes. I've not broken one yet. You will also find that properly shimmed trucks roll better as the journals remain more square with respect to the track and the bearing friction is reduced. Most of the available couplers are intended for truck mounting as this is the only way to make them work on 2' radius track although many small engines and cars as short enough to work with body mount couplers. With longer equipment, body mounting requires much larger radius track. Kadee supplies couplers in various body mount configurations that are suitable for use in 4' radius track, see Kadee Tips for more information on body mounting vs. truck mounting. Which Coupler Should You Use? Table I shows a summary of the attributes of each type. Your selection should be based on the way that you operate, your layout's characteristics and your budget. If you mostly run trains in continuous operation with little switching, the symmetrical hook and loop will provide excellent service at minimal cost even though the appearance is less than wonderful. If you have mostly Aristo equipment, then the Aristo coupler will work fine. If you have mostly Bachmann equipment, then you should probably use the supplied hook and loop couplers as the Bachmann knuckles uncouple by themselves so often. For more realistic operation involving a lot of complicated train movements, then either the LGB or Kadee couplers will provide excellent service. Which did I use, you ask? I have an indoor layout with only scenery work left to go and an outdoor layout under construction. On the indoor layout, which is built with virtually all tight radius curves, I use the LGB coupler with excellent results. Most of the uncoupling points are within easy reach and the other four points have LGB automatic uncouplers. My benchwork has sagged in some places and the Homosote roadbed has warped a little so slight grades do exist on track that should be dead flat. The LGB coupler is a definite advantage in this situation. Even a Bachmann car with metal wheels can free roll on a 0.5% grade. On the outdoor layout I use Kadee "G" scale couplers. Easy manual uncoupling is not a significant advantage as most of the uncoupling points are out of easy reach. This layout is designed to accommodate Kadee's uncoupling quirks so car rolling isn't a problem either. Also, I use the Aristo Train Engineer throttle and I don't want to consume accessory control functions with uncoupler controls. What do I do about incompatible coupler types between the layouts? These layouts are 3000 scale miles and 50 modeled years apart so little interchange of equipment occurs. Even if equipment is interchanged, it only takes a minute or so to swap out the couplers.